Posted December 7th, 2018 by admin & filed under Accountant, Tax services. No high-income earner wants to pay a heavy tax. In fact, for them, the tax is a matter they prefer to discuss in a hushed tone. Moreover, it appears as if their trying to save money is like cheating the government, which is not the way it is. For the most part, the tax incentives usually come from the high-income earning individuals. Due to this most of the wealthy people take the assistance of tax filing services from renowned experts. In some of the cases, the taxpayers don’t actually qualify for the tax benefits. There are numerous Americans who earn higher, but fall in the middle-class section or those who have many expenses to cover. Tax planning is crucial since it helps achieve tax efficiency. It ensures you pay the least amount of tax in the given situation. This type of practice is present for all taxpayers having annual earnings of $40,000 and above. 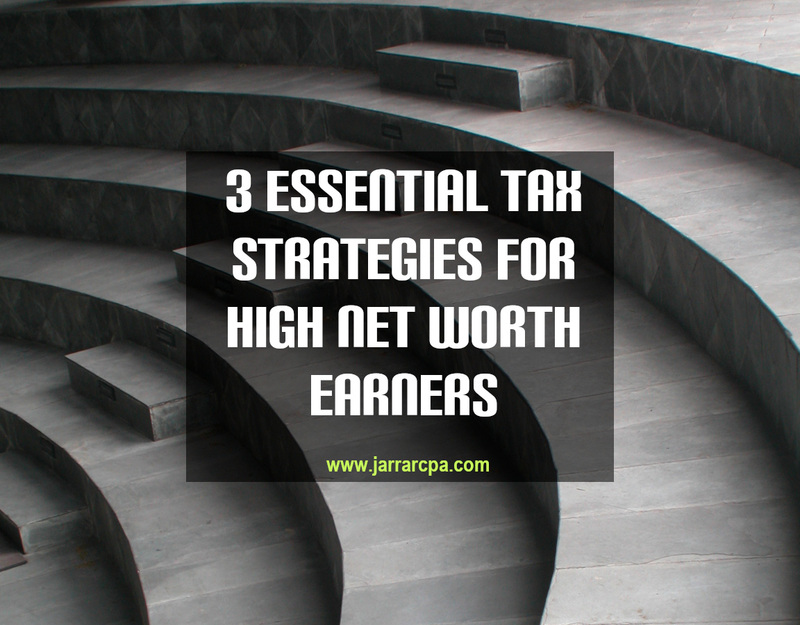 But there are some tax strategies that every high come earners need to follow. This is where a little analysis, proper strategy and your creativity comes into action. The present tax system usually taxes the individuals based on the income brackets. This is how it works, the higher your income, the higher the tax you need to pay. The government implements a credit and deduction system that has been designed to limit your tax amount. You would see that only 1 percent of the taxpayers pay just 40 percent of the federal tax income. Since most individuals lack the skill and knowledge about tax filing, they go ahead and hire tax accountant Los Angeles. Whether you have inherited your family business or you own a business, there are some tax strategies you need to follow to save thousands more on the taxes. You definitely need to have a retirement plan, after all you won’t be going on working till your death. However, if you really want a comfortable retirement plan, investing in the right type of retirement account is one of the ideal strategies for high income earners. If you are working for a company having 401(k), ensure you make the most of it. This is mainly because the 401(k) contributions consist of pre-tax dollars. This usually gets deducted from your salary or paycheck and gets deposited in the 401(K) account. It is a great plan if you are considering a low tax rate during retirements. If you have an accountant, know about this when discussing tax filing services. The traditional IRAs don’t actually offer you any tax-deductible benefits if you have a Modified Adjusted Gross Income of $72,000 and the earnings get tax-deferred. However, the IRAs allow you to contribute after tax dollars while the earnings get tax-free. You must keep in mind that if you have pre-tax IRAs, the IRS would usually impose a tax on the accounts during the conversion. If you are self-employed and you have employees, try setting up a Simple IRA. It is less costly for the business and you need to make a low contribution annually. Before you take the assistance of a skilled tax accountant Los Angeles, you need to make some considerations. Paying tax later is better than paying it now- It is known as deferring tax. If it can be deferred for a later time, it is better for you as a taxpayer. Tax deferring provides you flexibility and if legally possible, you can defer it. Don’t spend a dollar to save 30 cents- It is a rule that you must follow if you are a business owner, but it applies to all taxpayers. Usually at the year end, the taxpayers always try their best to reduce the taxable incomes by overspending. A strategy like this actually makes sense if you are purchasing items you wanted always, irrespective of the tax plan. You definitely don’t need to spend money haphazardly just to save a few cents on your tax.